Two of the most talented and beautiful actors – #RajkummarRao and #AditiRaoHydari are looking amazing on the latest cover spread of #ELLE for the entire month of July. 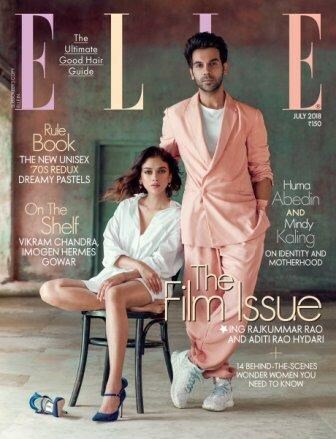 ELLE has come out with a special – The Film Issue, which features Rajkummar and Aditi in the most stunning and surreal avatars. Like a gentleman, Rajkummar Rao is standing beside Aditi Rao Hydari, who is sitting charmingly on a chair. The actors are sporting designer wear from Louis Vuitton. Though both the actors haven’t worked together in a film, except few ads, we would love to see their chemistry on-screen! On the work front, Rajkummar Rao is busy with Mental Hai Kya and Ek Ladki Ko Dekha Toh Aisa Laga, which features Kangana Ranaut and Sonam Kapoor, respectively. Aditi Rao Hydari is busy with south Indian projects, such as Sammohanam and Chekka Chivantha Vaanam.